Lord Rama has been the epitome of righteousness and gold standard while judging one’s devotion towards parents, the truth, and his words. The fact that he left his kingdom for 14 years to wander off in the woods just for the sake of promise to his father and stepmother Kaikei goes on to show his faith and respect to his elders. His 14 years of exile or vanvaasa was not uneventful either. Defeating the mighty ruler of Lanka- Ravana for taking away his wife Sita with the help of the monkey army he gathered by helping King Sugriva marked the end of his exile. Many accuse the Lord of listening to his subjects rather than showing faith in his wife and sending her for exile after being captured by Ravana. 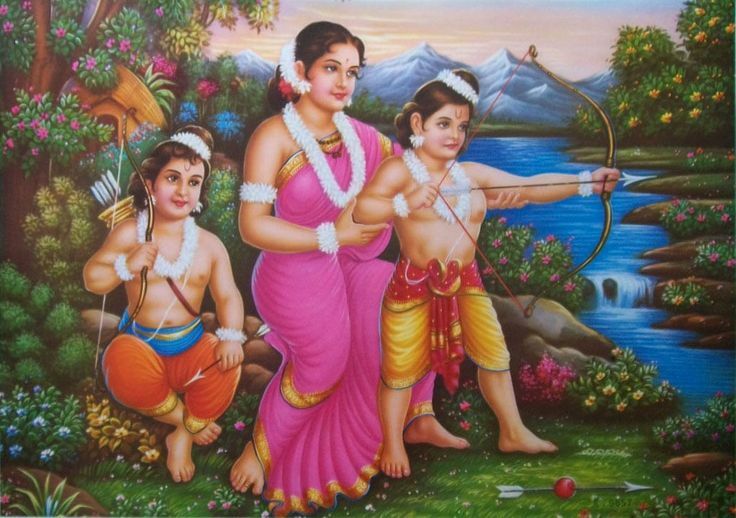 The importance he showed towards maintaining an image of a King for his subject to follow Lord Rama only cost him the joy of raising his sons- Lava and Kusha and eventually losing his love, Sita. His ability to separate his personal life from his duty as a King, a just and fair king at that has made his rule a role. Let’s learn more about Rama Rajya. Ram Rajya according to many scholars meant that the state (Rajya) was the sole legitimate agency wielding power (force), which imposes limits upon its exercise of power, either for the greater happiness of the people or to evade a greater tyranny that could be caused by moral outrage or self-righteousness. Ram Rajya, where peace, prosperity, and tranquility reigned, for there was no one to challenge the seat of Ayodhya, literally the land without wars. Incidentally in Hindi, “Ayodhya” means “a place where there is no war.” Hence “Ram Rajya” is described as an ideal society. It is believed that there were not dacoits during his regime. All led a virtuous life. Nobody spoke any untruth. Anybody could place a bag of gold or jewels even in the main street. No one would touch it even. Dharma was its stepping stone. Shastras were the guiding principles. Rishis, Yogis, Munis and Brahma Jnanis were the guiding lights. The Vedas were respected and followed. 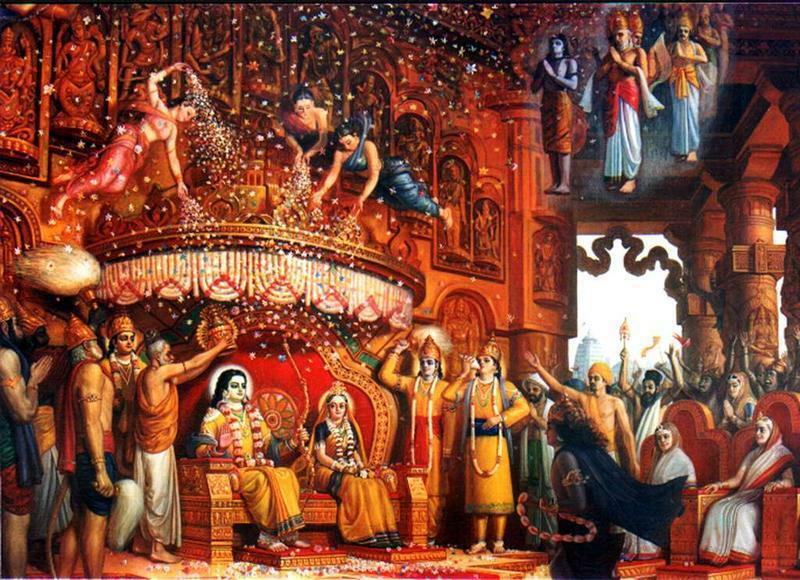 Therefore, Rama Rajya endured and prospered. And it is even now spoken of as the perfect form of government. In due season, rain and shine came. The air was fresh and cool. The trees were laden with plenty of fruits. There were abundant flowers of sweet fragrance. There were plenty of crops in the fields. The Brahmins were well-versed in the Vedas. They were virtuous. They stuck to their own duties. The Kshatriyas were brave. The Vaishyas and Sudras did their Svadharma. They were free from passion, greed, and envy. The twice-born were faithful to the rites and scriptures. They were truthful in their words and deeds. They had God-fearing nature. They had a love for all creatures. the culture of Kiskindha… mostly tribal and backward in terms of development in the modern sense. Dr. Moily recited a stanza describing King Dashrath’s attitude in treating even the poorest of the poor as ”equal,” saying ”his feelings reflect true Rama Rajya.” Another stanza he cited dwelt on the education Vishwamitra imparted to Rama and Lakshmana, by ordering the brothers to walk instead of covering a distance on a chariot. ”Unless the rulers, administrators, experience the pain and suffering of the poorest and weakest, they cannot be good for their jobs,” he summed up. A lot could be learned and utilized in order to make the country a better place if we could take this Rajya as an example.